Steve Jobs may be on a medical leave, but according to people familiar with the matter, this doesn't stop him from working on the next-gen iPhone and iPad. According to these sources (as cited by WSJ), he is still "closely involved in the company's strategic decisions and product development", with the iPad 2 and iPhone 5 specifically named among these products. It's worth noting that the last time Jobs requested a leave on medical grounds, Apple's COO Tim Cook stepped in, and during his tenure as Apple CEO, the company's stock rose 78%. 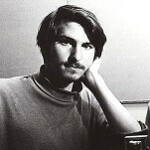 How important is Steve Jobs for the future of Apple? At first I was going to call you an idiot. Then, I noticed that you capitalized "Him" as if Jobs were a deity. Very subtle, but very well played. While I will never return to Apple's playground due to the restrictions and dictatorship, I must admit that Steve Jobs has done much to rejuvinate a dying company. His insight in marketing prowness, has made Apple the largest success story of the decade. His ability to attract the new generation in taking interest in Apple and mold that interest into support for the company, is commendable with the highest respect. John B. Are you retarded... apple is not a dictatorship... far from it. They are based on open standards... html5? webkit? He's an icon among CEO's. He's really passionate about his visions. And I guess his passion and his miticulousness has made him a control freak to a degree. But this guy really knows his stuff, and I don't really mind. I am very happy with my Apple devices, and I totally get him (most of the time). apple makes great devices... and has great vision... i just wish they would loosen up their demands and compatibility issues and stop being as controlling as they are over their products and consumers... most apple consumers dont realize this, but its like they are minions of apple who just keeps feeding them cookies to keep them happy. Even though i'm an android user i have to admit i have nothing but love for Steve Jobs. You can't hate on a man who knows what they're doing and does a good job at it as well. We should protest against APPLE. They would always fail without Steve Jobs, but he needs his medical leave of absence so he can rest.